There are many factors that comprise the successful implementation of a SharePoint solution. Regardless of what it is you are building, the following key success factors apply. Each of these Key Success Factors is described in more detail below. First and foremost, your information must be stored in a manner that is consistent, easy to understand and easy to maintain. Without information, you wouldn’t have the need for a content management solution and without easing the pains associated with storing and managing this information, Contributors will be less likely to use the solution. There are specific techniques that can be used when implementing SharePoint that can simplify the contribution and maintenance of information. Search scoping, information aggregation and metadata filtering. Without adding some level of structure to your content, you will accomplish little. Storing and managing your content using the same approach as what was found on file shares adds zero value. You will eventually end up with hundreds, if not thousands, of sites. Many of those sites will have document libraries with many folders and sub-folders. Users will quickly be uncertain to where content should be stored. Managing unstructured content without any level of categorization will always lead to diminishing adoption, frustration and distrust in the technology. Take the time to categorize your content, apply grouping principals and governing rules for appropriate use and you will be working towards a solution users adopt and become more efficient executing day to day business operations. Understanding – The implementation team must have a thorough understanding of the content to be managed; thus implementing a solution that is consistent and eliminates ambiguity. For example, the term Contract can have many definitions in an organization; Employee Contract, Customer Contract, Vendor Contract, etc. These contract examples have entirely different meanings, uses and associated processes. By thoroughly understanding the information, a solution can be appropriately architected to eliminate this type of ambiguity. Responsibility – The responsibility of information belongs in the hands of the information owners. When we implement solutions that aid in the ownership and responsibility of managing information, that information is more likely to be fresh, up to date and accurate. Making process an integral part of architecture is a great way of adding value to your business. Metadata – Metadata allows you to store and manage instance specific information for your content. For example, having the ability to store the date of a meeting with the meeting minutes document will allow you to quickly locate that meeting document by meeting date. And, storing the value of a contract with each customer contract document would allow you to filter all customers that have executed a contract greater than $100,000; which might aid with a marketing effort. Using appropriate information architecture, categorization and grouping principals, will allow you to configure default metadata values. This eliminates the need for a user to input the metadata value but allows it to be present for search, faceted filtering, aggregation, workflow decision and triggers, etc. An example of this would be a Project Number metadata column associated with a project document. If you have all documents, associated with a specific project, managed in a site, you already know the project number and can configure a default value; i.e. the Project Number. User education is also a very important technique. The more your users understand the value of metadata, the more likely they will be to ensure metadata values are accurate. Demonstrate the value of metadata to your users by setting up a POC and show them search results with and without the use of metadata. Demonstrate faceted filtering and advanced search with and without the use of metadata. It is a powerful message. Metadata is also the primary means by which users can filter aggregate views of content; this is known as faceted filtering. Virtually all employees in your organization will consume information to support their specific day to day business needs. The consumption of information will be determined by a specific contextual need. For example, an employee may wish to search your Intranet for the latest parking policy or a project team member may wish to find notes for a meeting that occurred two months ago. When considering the consumption of information, we also must consider how it will be presented to those consumers; search results and aggregate views are but only a few that will be required. Other means of presenting information will include dashboards, printed reports, charts, etc. The only means by which we can query information and produce accurate search results, faceted filtering, aggregate views, dashboards, printed reports, charts, etc. is by first architecting the information; so we know what it is we are querying. Without this, none of this will be possible! Managing the Change of Information – Information is changing on a regular basis; project documents change and evolve, employee handbook and corporate policies are in a constant state of evolution. Architecting your content management solution to facilitate the evolution of information is critical. Work-in-Progress versus Published Information – During the process of information creation and collaboration, the state of that information is considered work-in-progress. The solution must provide the means to determine work-in-progress versus published. In some cases this is delivered using content versioning or security. In other cases it requires a more complex means of disseminating the information. Keeping Information Fresh and Up to Date – It is the responsibility of information owners to keep information fresh and up to date. If the information in your content management solution is allowed to become stagnant and out of date, consumers are less likely to visit your Intranet and information consumption. Versioning – An advanced content management solution provides the ability to version your content, view and roll-back to previous versions. The lifecycle of content management requires this functionality. Archival and Destruction – When information has reached the end of its lifecycle, often it is archived and/or destroyed. This applies to all information in your environment, not just corporate records. 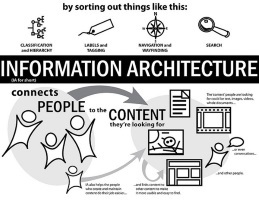 Thoroughly understanding the lifecycle (creation, evolution and eventual destruction) of information is a critical element of information architecture. Governance of your information management solution comes in many forms; policies, procedures, processes, guidelines and education. Without governance all of your hard work architecting a solid solution will eventually crumble. The negative consequences are too many to list in this article. Infrastructure Governance – In most organizations, there is sufficient infrastructure governance; server builds, patches and update schedules, SLA’s and so on. The infrastructure to support your SharePoint installation will mostly fall within this existing governance. Solution Configuration and Customization Governance – Configuration and customization governance is equally important as the infrastructure governance. Implementing processes and controls to appropriately manage change, meeting up-time SLA’s, is critical. Solution Use Governance – It is here where most implementation teams fall short. Governing the use of your SharePoint implementation is a means to keep configuration consistent. Because the non-technical user doesn’t understand the security model, they inadvertently give access to the wrong users. I have see employee salary information exposed in this exact situation. Consider a non-technical user creating a new document library and not using the data types (content types) your implementation team configured. Now that same non-technical user uploads policy documents to this new library. These policy document won’t be aggregated to your corporate policy book nor could they be searched (and filtered) as other corporate policy documents are. These are but a couple examples of insufficient use governance; there are many more negative consequences. My recommendation is to lock your implementation down tight as can be; only allowing the implementation team to make modifications at first. Implement a federated use governance model as you educate users with the appropriate skills to make modifications that meet your best practices, policies, procedures and guidelines. Without governing the implementation, customization and use of your information management solution, it will evolve in an inconsistent and out of control manner and quick become of little use to the business. Education at all levels is of paramount importance. In most business environments your users have been driven to use file shares, local drives, email systems, etc. to store and manage their information. Moving your culture from “the way we have always done it” to a completely new environment is a very large chasm to cross. Users must be appropriately educated to trust and use the new system. As you can see, there are many factors that contribute to the successful implementation, adoption and use of a SharePoint content management solution. Installing SharePoint, configuring a few sites and throwing the keys to the kingdom over the wall will fail every time. On the other hand, implement sound information architecture techniques, governance and education will lead you down a path of success! If you are in need of help with your SharePoint implementation, Information Architecture, education or training, please don’t hesitate to contact me; this is what I specialize in!